Basic requirements: Link up . . . tweet your progress . . . participate in at least one challenge to be eligible for grand prize . . . Wait. Prize? Yup. There are challenges so check out the above link to read about it. There is one hitch. 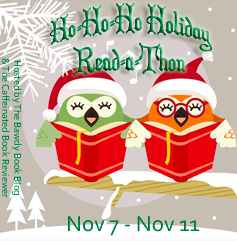 . . this is a holiday RaT so, "Read as many holiday related books from your YA, NA and Adult collections as you can". Funny, one came in the mail last week. Notice that children's books don't count. I'm thinking anything 12 and up? I'm a sucker for a RaT and I love holiday books so no matter how busy I am, I'm going to sign up! Talk about setting myself up for failure. sheeze, at lease I'll have a good time on my way down. :-D That is if I can stop myself from reading the book before Thursday. I don't expect to read five books let alone all of these but wanted to list the Christmas books I bought recently. I have some unread books upstairs too that I need to find and list. One needs to be kept aside to be my first book of 2014. I'll use this list for the Christmas Spirit RaT and RC too.